The smallest block should not be smaller than a 1x2 and even that is a choking hazard for under 3 years old. 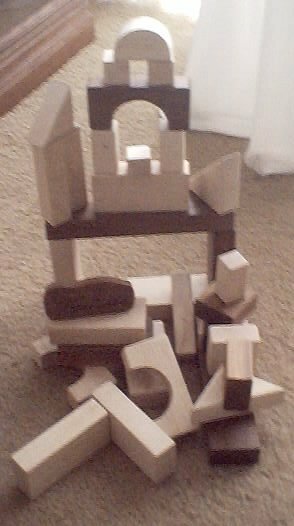 I think giving these to younger than 3 is just asking for trouble as blocks hurt when thrown or smashed down. I think going with 1 1/2" thickness would be nice, but decided that just used too much expensive maple. I chose to use real 1" thick stuff. With a 1 1/2" thick goal, you need to either make a smaller set, or plan on using even more than the 18 board feet I use. I think going with the 1" sizing is a better choice. A block set without a box or wagon to store the blocks in is a pain for Mom & Dad. My sets fit in a wagon whose bed inside is 18.24" x 24.25" x 3.5". The extra quarter inch makes the blocks easy to put in and get out. That size wagon holds 1.5 x 2 = 3 board feet per layer times four layers giving 12 board feet. The good news is this makes one honker of a set that is just about as big as kids can use or handle. It has about twice as many blocks as we used to find in stores. The bad news is with the cost of 5/4" maple here this is not one of those trivial scrap gifts that we can whip out by the dozens. Because I had to buy 5/4" stock to get the real 1" thickness, plus there is a lot of waste for saw kerfs, etc. I needed 16 to 18 board feet provided I picked the stock real careful to make sure I can get an even number of blocks from both the width and length. It's easy to need another couple of feet. I did make a few sets out of scrap, but found that was a real pain. I made one set out of oak firewood, and that came out well, but took a lot more work. The set I made for my own kids years ago piles into a 17" x 11" x 11" box (standard box for photocopy paper). It is half walnut and half maple. A friend's dad had a stash of rough cut black walnut from their ranch and after helping them with some work, they let me have that walnut! Although the walnut is not good for little ones, mine were out of the chewing stage, so that combination really looked nice. Make all dimensions the same or multiples of each other, e.g., 1x2, 1x3, 1x4, 2x2, 2x3, 2x4, etc. (I used 1" as my standard and started with 5/4 hard rock maple). I ran all through the belt sander after planing, then did the rip cuts first, jointed and sanded them (remember to leave enough material for the joiner and sanding!). For the arches I ripped a double wide strip, then used a 2" diameter hole saw to put holes down that whole strip, then ripped it in half. Before cutting the blocks to length I ran all four long edges over a 1/8" quarter round on my router table. The rounding over made for nice smooth block edges that will not splinter easily. My Makita SCMS with a stop block worked wonders in helping me to cut all the blocks to length. It cuts so smoothly that the ends needed minimal sanding. I did make sure there were a few long big blocks to use for roofs and bases. After the cross cuts I used a lot of backer boards to route the quarter rounds on the ends. Make the arches 1" in radius with 1" on each side creating a 1x2x4 with the half circle on the 4" side. Make some 1x4 dowels or similar to go with the arches. Sand to at least 220 grit, preferably 440. Finish with a safe finish or leave unfinished. I used three very thin coats of wipe on poly for all the finishing. Poly for me was better than mineral or tung oil as it is hard so helps stop the splintering, dries quickly without having to be babied, and these durn things have to be cleaned once in a while. Poly does clean up like new quickly. And one caution, this is one of those highly repetitive tasks that can easily get taken for granted and lead to an inattention accident. While making this set of blocks I sanded a knuckle pretty good at about one in the morning.